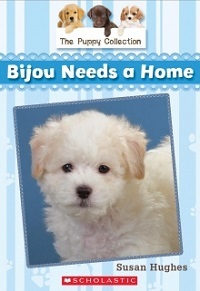 CM Magazine: Bijou Needs a Home. (The Puppy Collection, 4). Bijou Needs a Home. (The Puppy Collection, 4). Owning a pet is a big responsibility � they require a great deal of time and attention. That is what Kat�s parents tell her all the time, and it is because of this that Kat cannot have a dog. Fortunately for Kat, her Aunt Jenn owns Tails Up! Grooming and Boarding, and Kat is often able to help out. She loves this job! When someone leaves three puppies on Aunt Jenn�s doorstep, Kat and her friends are asked to help find the puppies a forever home. Kat swallowed hard. She stared at the puppies. What if they couldn�t find homes for all three puppies? What if one pup was left behind and never found his or her forever family? Bijou Needs a Home is the fourth book in �The Puppy Collection� series by Susan Hughes. This is a series that will attract many animal loving children. The cover of this book has a photo of an adorable white bichon frise puppy that immediately grabs your eye. Kat and her friends, Maya and Grace, are very likeable and easy to relate to. While the story focuses on the girls and the puppies, the author also touches on the girls� lives at school and the interactions they have with some of their classmates. Life isn�t always easy. Sometimes there are people that are mean, and the girls have to find a way to work things out. When one of the mean girls, Megan, wants to adopt a puppy, the girls have a choice to make. They have to decide if Megan would be a good forever friend or if there is no hope for her. Susan Hughes is an award winning Canadian writer. She writes a variety of picture books, chapter books, as well as young adult novels and nonfiction books that everyone can enjoy. She lives in Toronto, ON, and has been a freelance editor and writer for about 30 years. �The Puppy Collection� novels are entertaining, pull at your heart strings and teach valuable life lessons. Leanne Franson provides the black and white illustrations that capture each moment of the story in such a way that helps to make the characters more relatable. Bijou Needs a Home is told through easy to read chapters, each approximately 7-10 pages long. Each chapter contains at least two illustrations which really aid the reader in comprehending the story and which express the reactions and feelings of the characters. The chapters are a nice length and are written with words that are easy for the reader but, at times, do provide some challenge. This combination is ideal for children that have started to read chapter books as the story contains language that is comfortable yet it also introduces new words and ideas that will help to increase vocabulary. The illustrations help to explain the story on a different level which keeps the story enjoyable and motivates the reader to continue. It has been my experience that students enjoy reading books about animals. I love that in Bijou Needs a Home students learn the importance of proper care of animals. As well, the author manages to touch on a conflict between Grace and Megan. She demonstrates to readers that it is not always best to judge people because they are sometimes mean, but to also acknowledge that a person deserves a chance to show her/his good side. Bijou Needs a Home is a great chapter book, particularly for students that love stories about animals. Lisa Case is a librarian from Calgary, AB.